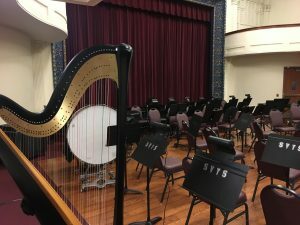 My freelance performing schedule doesn’t permit me to participate in an orchestra regularly, but the slower season in February worked out for a night of playing harp parts for some well-known operatic love songs and symphonic pieces! I joined the Sangamon Valley Civic Orchestra for their “That’s Amore” concert at the Hoogland Center for the Arts in Springfield, featuring works by Mozart, Puccini, Bizet, Tchaikovsky, and Mascagni. It also gave me the opportunity to mentor the harpist from the youth symphony, who was also playing for this concert. 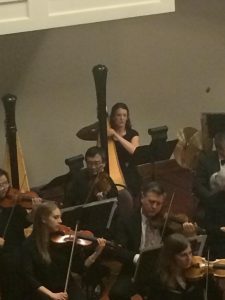 I would have loved to have someone sit next to me to help with cues and counting all those rests during some of my first orchestral experiences! Although most of my work is for weddings and private events, I also play orchestral and chamber music, and love collaborating with and accompanying other musicians on projects large and small. Contact me through www.TheClassicHarpist.com to discuss your musical needs! 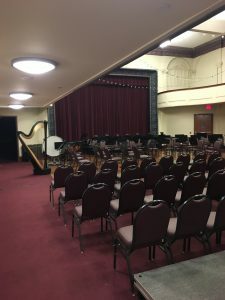 This entry was posted in Concerts and Recitals and tagged central illinois, concert, hoogland center for the arts, orchestra, penti, springfield. Bookmark the permalink.